CoolSculpting (Fat freezing) is fast becoming a very popular treatment in Ireland. Popular in the US since 2008 cryolipolysis is still relatively new in Ireland and people tend to have a lot of questions. To help people make decisions we’ve come up with a list of our most common questions asked by our clients. Coolsculpting is Cryolipolysis which is a non-invasive body sculpting and contouring treatment that freezes fat cells the remove and reduce fat in an area. Cryolipolysis freezes to up to -11°c which kills the fat cells and destroys them. Cryolipolysis is a non-invasive body contouring treatment used to reduce fat cell volume by freezing. The method involves the controlled application of cooling within the temperature range of +5 to -11 °C for the non-invasive, localized reduction of fat deposits, intending to reshape the contours of the body. After 12 weeks you should see full results of your CoolSculpting treatment. Many people notice results from about 4 weeks however it will continue to work for 12 weeks and many people get more than 1 session will likely get it before the 12 weeks are up. A session refers to each placement of the Coolsculpting Applicator, for example, to treat someone’s stomach you will likely need a minimum of 2 sessions side by side meaning you would have 2 sessions at one treatment. This is totally dependant on what results you are seeking, each CoolSculpting treatment session reduces fat by 20% – 25%. At your consultation, you, your doctor and a CoolSculpting specialist will decide how many sessions will help you achieve your ideal transformation. How Much Fat Do I Lose? At each session, 20% – 25% of fat cells are removed from each area treated. At your consultation, you will be shown your expected result. Depending on the area being treated typically each section treated is 45 minutes, for areas such as under the chin the sessions are 35 minutes. This 45 or 35 minutes on each area is treated by the machine and then followed by an additional 2-minute massage. Each section will take 45 minutes followed by the 2-minute massage, meaning if you are treating 2 areas at one treatment you will have 90 minutes attached to the CoolSculpting machine and then follow with massage and aftercare. Do I have to follow a diet after treatment? No, however many people after being pleased with their results to tend to maintain a healthier lifestyle in an effort to see the best from their results. Though CoolSculpting is not a treatment for skin laxity there have been reports of tighter skin after receiving treatment. Here are some before and afters where though our client was only treated for fat reduction there is an improvement in skin laxity. 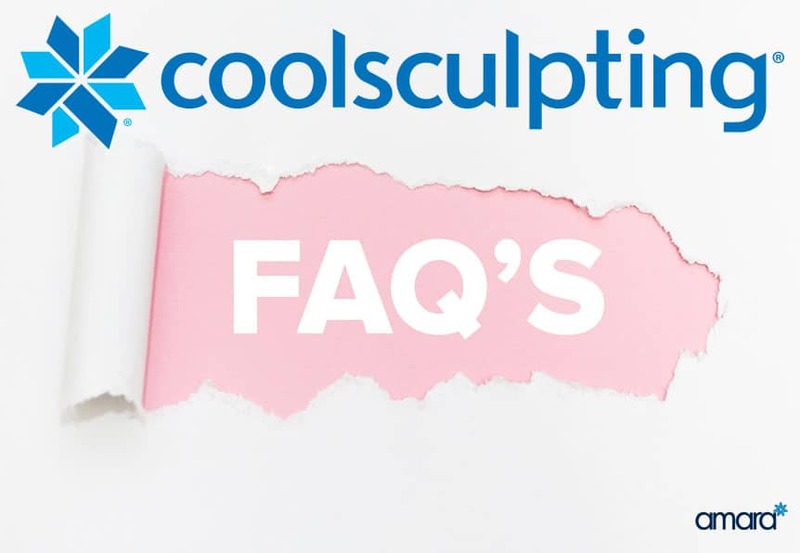 What questions do you have about CoolSculpting or fat freezing? Ask us below! How much does it cost to do under the chin with coolsculpt? Hi Miranda, For a definite price a consultation with our CoolSculpting doctor and the CoolSculpting specialist would be necessary. This is because some people may need more than one session at one treatment depending on their chin. However, prices start from €800 per session.